The active monsoon trough brought moderate to heavy falls to parts of northern Australia, while a tropical low over northwest Queensland, embedded on an active monsoon trough, resulted in heavy falls and flooding in northern Queensland. The highest weekly total was 1669 mm at Woolshed, west of Townsville in north Queensland. 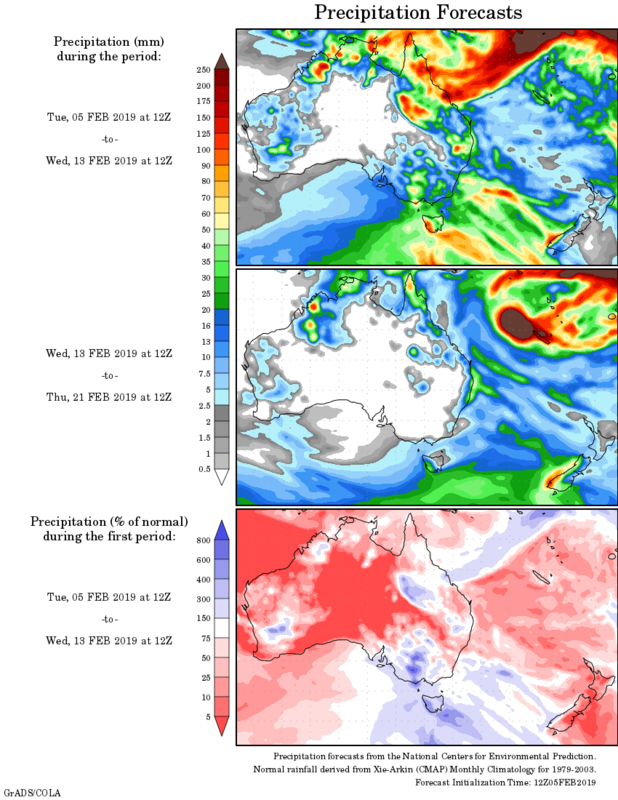 Past seven days: At the start of the week, the monsoon trough stretched across the northern tropics from the Coral Sea to ex-tropical cyclone Riley well to the west of Australia, offshore of the Pilbara coast. Showers and thunderstorms formed near the surface trough and produced light to moderate falls in the Pilbara, while thunderstorms produced moderate falls in the Top End in the Northern Territory. The monsoon trough remained slow moving over the tropics, generating widespread areas of rain and thunderstorms, with locally heavier falls over much of northern Queensland. An embedded low situated over northwest Queensland produced heavy falls around the Gulf Country and northern interior. In the east, very heavy falls were recorded from Ingham to Ayr, in the region around Townsville. The tropical low embedded on the monsoon trough deepened over northwest Queensland, and increased monsoonal flow across northern Queensland. Extremely heavy rainfall continued over several days across the Herbert and Lower Burdekin District. Flooding occurred in the Ross, Bohle, Haughton, Herbert, and Black rivers and Bluewater Creek, with extensive flooding in Townsville. The embedded low almost stationary until the end of the week, maintaining a strong monsoonal flow across northern Queensland. Elsewhere in the country, thunderstorms and showers developed near a pre-frontal trough tracking across southeast Australia at the start of the week. Light to moderate falls were recorded in parts of southern New South Wales, eastern Victoria, and western Tasmania. Around the middle of the week, some showers in onshore flow brought pockets of moderate falls to the central coast of New South Wales. A trough and front again brought thunderstorms and showers to eastern Victoria and southeastern New South Wales at the end of the week. Rainfall totals in excess of 800 mm were recorded from about Ingham to Ayr in north Queensland, with higher falls centred around Townsville, including the highest weekly total of 1669 mm at Woolshed, west of Townsville in north Queensland. Higher totals were reported by some gauges not within the standard Bureau network, including 1852 mm at Upper Bluewater. Rainfall totals in excess of 400 mm were recorded in the northwest and northern interior of Queensland, and surrounding higher falls on the north tropical coast. Some spots in northwestern Queensland exceeded 600 mm. Rainfall totals exceeding 150 mm were recorded in Queensland’s northwest, northern interior, north tropical coast, western Cape York Peninsula, and also at some locations about the coast of the Top End in the Northern Territory. Rainfall totals in excess of 100 mm were reported in areas of the Top End in the Northern Territory, and across much of northern Queensland. Rainfall totals between 50 mm and 100 mm were recorded in parts of the Kimberley in Western Australia; much of the Top End in the Northern Territory; and from the eastern edge of the Territory, across nearly all of the northern half of Queensland. Rainfall totals between 10 mm and 50 mm were recorded in the Pilbara and Kimberley in Western Australia; surrounding higher falls in the east and northern of the Northern Territory; most of the remainder of western Queensland and along the State’s east coast; along the central coast and southeast of New South Wales, and pockets in the central parts of that State; much of the eastern half of Victoria, and parts of western and southeast Tasmania. Little of no rainfall was recorded in remaining Western Australia away from the Kimberley and Pilbara; most of the southern half of the Northern Territory; the southeastern quadrant of Queensland away from the coast; South Australia; most of inland and northern New South Wales; the western half of Victoria; and parts of eastern and northern Tasmania.